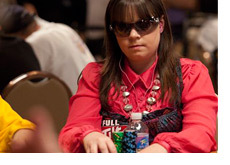 Annette "Annette_15" Obrestad has already accomplished a great deal during her career as a professional poker player. One of the most accomplished and feared online MTT players in the world? Check. Youngest player to ever win a World Series of Poker bracelet? Check. Obrestad will continue to add to her resume as a professional poker player when she appears on "Poker After Dark" for the very first time. I'm not sure what this week of "Poker After Dark" will be called, but one thing is for sure - there will be plenty of table chatter. Lindgren and Esfandiari will both be looking for their first win on PAD - Matusow, Hellmuth and Laak all have at least one victory on the show. Obrestad is finally able to play in Vegas after turning 21 in September. It should be interesting to see how she does on "Poker After Dark"..